Periodontics refers to the prevention, diagnosis, and treatment of periodontal (gum) disease. Skyview Ranch Dental Clinic offers periodontics to Calgary residents that have come to rely upon us to keep their teeth and gums healthy. Good oral hygiene is your best line of defense against periodontal diseases such as periodontitis. During your appointment, we will examine and evaluate your teeth and gums to develop the best course of action. Bacterial plaque is the most common cause of periodontal diseases. If the plaque is not removed from your teeth with brushing and flossing it will harden into tartar, which needs to be removed by a professional. Left alone, the plaque and tartar can damage your teeth and gums, causing gingivitis – inflammation of the gums around your teeth. Persistent gingivitis can cause pockets to develop between your teeth and gums. This is where the bacteria will build up and cause periodontitis. To prevent tooth loss and other health issues that can arise from periodontal diseases be sure to get periodontics treatment in Calgary at Skyview Ranch Dental Clinic. All periodontal diseases are infections that affect the periodontium – the tissues around your teeth that support them. Periodontitis is a serious gum infection that damages the soft tissue and bone that support your teeth. The bone around your teeth will slowly recede and microorganisms such as bacteria will stick to the surface of your teeth and multiply. This bacterium causes inflammation to your gums. If left untreated, periodontitis will eventually cause tooth loss and it may increase your risk of stroke, heart attack and other problems. There are several types of periodontics treatments that you can receive from Skyview Ranch Dental Clinic. Sometimes all you’ll need are simple procedures and regular follow-up care to prevent or treat periodontal disease. However, if you’ve developed advanced periodontitis, sometimes surgery is required. Scaling removes tartar and bacteria from the surfaces of your teeth and beneath your gums. It can be performed with instruments or an ultrasonic device. 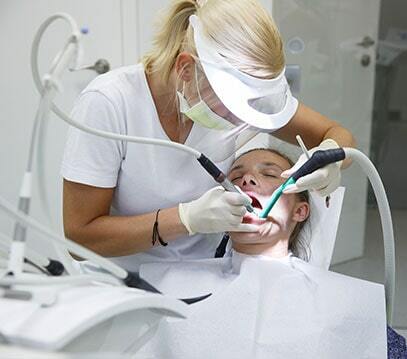 Root planing smooths the root surfaces of your teeth and discourages further accumulation of tartar. Pocket reduction surgery involves tiny incisions made in your gums so a section of the gum tissue can be lifted back. This exposes the roots for more effective scaling and root planing. The underlying bone may also be recontoured since periodontitis often causes some bone loss. Regenerative surgery will allow the bone destroyed by bacteria to regrow using a special piece of biocompatible fabric or a protein-filled gel to help give your bone room to regrow. To determine if periodontal treatment is something you need included in your dental care, please contact Skyview Ranch Dental Clinic. We’d be more than happy to answer any questions or address any concerns you may have about periodontics in Calgary.